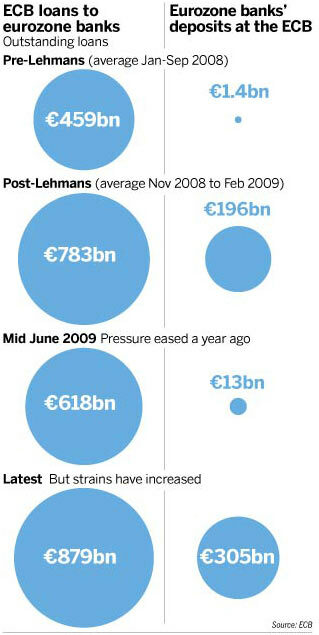 From the FT, inflation, deflation? People with a free-market orientation believe that the economy has a strong tendency towards equilibrium. Over the long term money is “neutral”: a rise in the money supply merely raises the price level. Incorrect. Markets may strive towards equilibrium, however, equilibrium is only a theoretical construct. Money, most certainly is not neutral. By raising the price level, it distorts the mechanism of the price level in allocating resources. In the short term, however, monetary policy may have a big impact on the economy. A big question, however, is over how to measure the impact of monetary policy in an environment such as the present one, when short-term interest rates are close to zero and the credit system is damaged. Monetary policy always has an impact on the economy, and it is always bad. Thus the huge expansion in government liabilities is designed to pick up the slack of credit creation that would normally be accomplished via the banking system. The liabilities created, are being transferred into the economy via welfare, TARP, bailouts, deficit spending on infrastructure etc. People worried that governments are “printing money” point to the balance sheets of central banks with horror and insist this is bound to be inflationary. Inside the eurozone, Germans are particularly concerned about the willingness of the European Central Bank to buy the debt of governments. Yet the growth of broad money (M3) in the eurozone over the past twelve months has been close to zero. That would suggest there is no inflationary pressure whatsoever. Or that the inflationary expansion is offsetting the deflationary contraction of credit engendered by the banking losses, that should have collapsed a number of banks into insolvency/bankruptcy. First, the monetary base does not itself have any impact on spending by the public. If governments borrow from their central banks to pay their bills, almost all of the money ends up as deposits of the commercial banks at the central bank (see, on this, this excellent paper by deputy governor Charles Bean of the Bank of England). Nonsense. What are the governments bills? Government wages/salaries for a growing public sector, subsidies to chosen/favoured industries, welfare payments, deficit spending on infrastructure, military, etc. Second, such reserves have no direct impact on lending by commercial banks (their assets) or on the broad money supply (their liabilities). Nonsense. The banks can create a loan, deposit, from their reserves. Currently, it is true that they are not doing this. Many analysts of the Austrian persuasion refer to the evils of “fractional reserve banking”. Yet there is no direct link between the quantum of bank reserves and the quantum of bank liabilities. Nonsense. Banks leverage their reserves, which is the reason that when loans go bad, they require liquidity to support their deposit base, which is only a fraction of their asset base. From the point of view of commercial banks, the question is only whether central banks will provide them with the liquidity they need. The central bank will normally do so through loans. The commercial banks do not need to own deposits at the central bank. Correct. They can use customer demand deposits to leverage their asset base. Third, should commercial banks be stimulated by the possession of reserves to expand their assets and liabilities, it is possible for the central bank to sell bonds to the non-bank private sector, to reduce those reserves. Talking chalk & cheese. Yes, money can be taken from non-bank sources, if they so choose to purchase government debt – but so what? Alternatively, central banks can impose a liquidity ratio on commercial banks, thereby preventing them from expanding their liabilities beyond a certain point. True. Unfortunately, Central bankers are merely puppets of their political masters, who are thieves. Thus the size of the central bank’s balance sheet has no direct impact on the total stock of money held by the public (however the latter is defined). Nonsense. If the central bank stands ready to create liquidity, the banking system knows that it can expand credit to the public. Thus although the CB balance sheet doesn’t change, the knowledge that it stands ready to create money is all that is required. Fourth, the policy of expanding the balance sheet of the central bank has an inflationary impact if and only if it succeeds in expanding the overall broad money supply beyond what the public wishes to hold, given the levels of economic activity, interest rates and expected inflation. Nonsense. Inflation is created by altering the structure of production. The supply of credit to sub-marginal borrowers results in loss making capacity being created, sustained only by an expanding monetary base. If that starts to happen: people spend their excess money, generating both inflation and rising inflationary expectations. This leads to a further rise in spending, as people flee from money. At the extreme, we find ourselves in Zimbabwe. When the public realise that money has no store of value vis-a-vis commodities, and exchange to simply dishoard, then hyperinflation is already underway. Finally, such an inflationary impact of “money printing” can indeed only happen if the overall money supply starts to grow rapidly. This is not now happening. Incorrect. The structure of production is altered. Sub-marginal loss making firms are kept in business. They consume scarce resources, thus pushing prices higher. 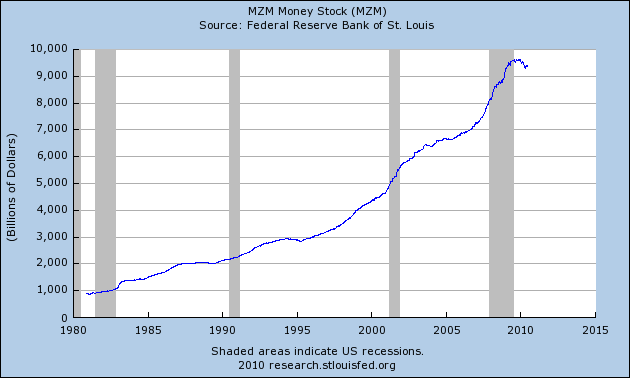 Only the monetary base is expanding rapidly. Should such a broader expansionary impact emerge, monetary policy will have been successful, the central bank can then raise rates, thereby preventing a rapid growth in credit and so constraining the growth of broad money. My conclusion is that what is happening to the balance sheet of the central bank is unimportant, except to the extent that it has prevented a collapse of credit and money. What matters is the overall supply of credit and money in economies. This continues to be stagnant in the developed world. Concern about an imminent outbreak of inflation is consequently a grave mistake. To the extent that there is a danger of “monetisation” of debt, it will emerge only if we fail to return to growth, because that is the situation in which it is most likely that public sector deficits will fail to close. It follows that strong monetary tightening now may increase the long-term threat of inflation, rather than reduce it. There will be no growth, as, the current inflationary policy absolutely is the wrong approach. We are again in a stagflationary environment. This is really only to try and catch a bounce. 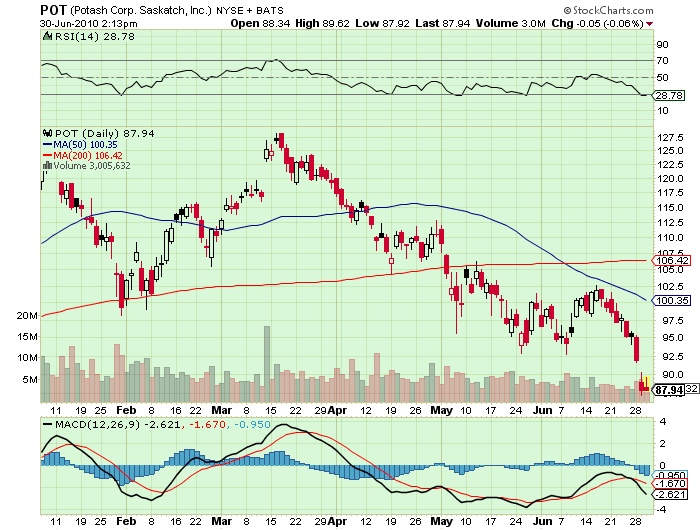 The monthly chart looks ugly with $70 a likely possibility. So this trade is going to be fairly tight. Oh it’s cascading knife times like these that demand the use of The PPT to weather the hot blades of imminent portfolio cut-pursing! Hmmmm. 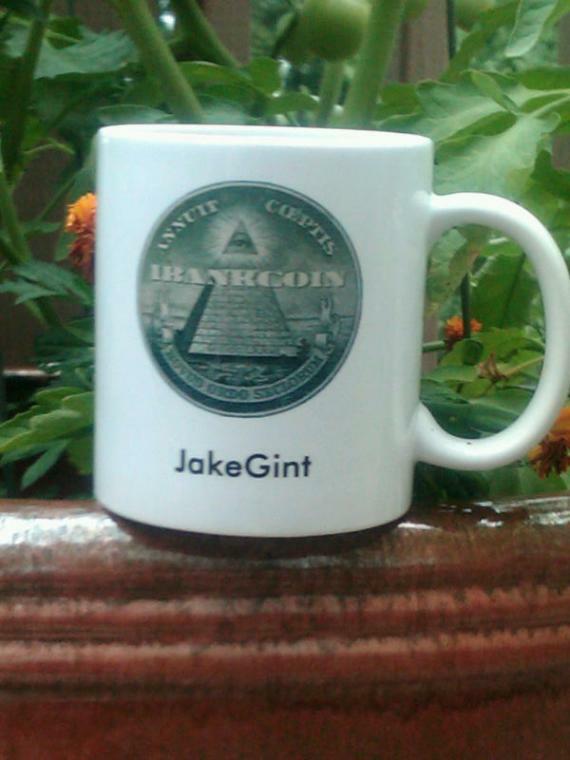 Far more pertinent, where the f**k is my iBankcoin mug? flippe-floppe-flye still owes me the $10 + 15% interest gambling debt, and I generously offered to clear the books in return for a mug. Needless to say, the rude chap didn’t even offer the courtesy of a refusal. He always was gutless. It should make no manner of matter to you that The PPT’s inventors are, collectively, an unrepentant Obama Voter from Pizza Island, and a crazed technophile man-child long since nailed-up inside his mother’s basement (by his own mother). It became clear, that the PPT is actually Jeremy’s brainchild, and nothing at all to do with that half-wit flippe-floppe-flye. For the love of Ike & Mike and their subsequent Massachusetts nuptials The PPT has been saving lives over these last few weeks– pulling children from burning buildings, quelling vast hive-swarms of killer bees, applying sun screen to sensitive ear lobes and high foreheads– metaphorically speaking of course. Come now Mr Gint, poetic licence and all, but that was sickly. You should go in there (in to The PPT) sometime. There are people in there offering plum cakes and first born children to the Fly for saving their retirements and their marriages. You probably think I’m kidding. I assure you I am not. This, as I have mentioned before, was an unforseen positive outcome. A trading room, that essentially allows some interaction with other traders. We’ve really got a machine going in there, we lucky few, we sceptered islanders, we England. Sometimes, I almost wish Fly’d give Ducati a few days in there, that’s how generous I’m feeling right now. He’d have to promise to be on his best behavior of course, but who knows what a glimpse of heaven might do? But damn your eyes sir, I am a gentleman of the highest manners. There is no credible inflation threat at this juncture. Hyperinflation is a complete joke. Those who get this wrong simply do not understand the role of credit in a credit-based fiat economy. 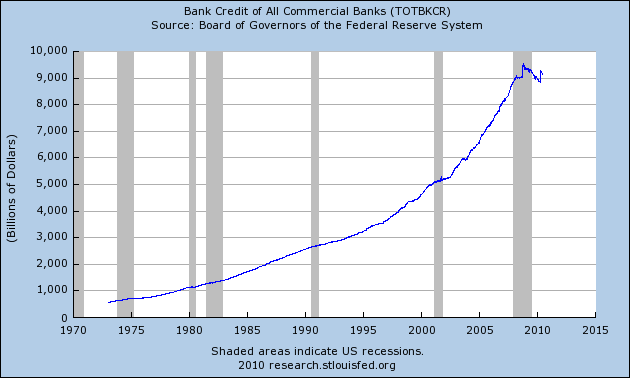 So let’s look at total credit in the US, as this forms the essential argument for Mish. We shall consider the sum of government and public debt. Do I even need to do the arithmatic? No, I didn’t think so. 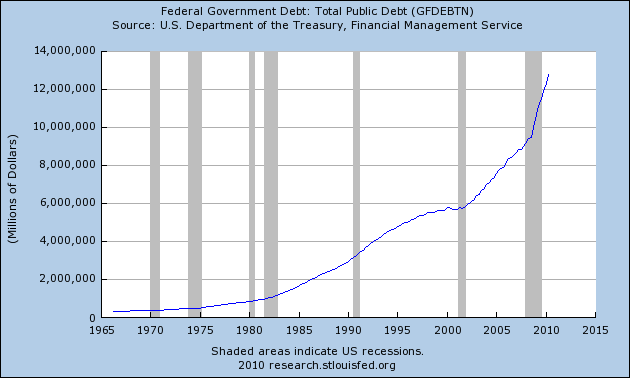 It is clearly visible that the total debt [credit] has expanded. Of course, government has coerced the taxpayer to pay the losses of the banks through transference of these losses onto the government’s balance sheet. The destruction of credit and especially credit marked-to-market on the balance sheet of banks and lending institutions is immense. Indeud. So immense, that they transferred those losses to the taxpayer via the government. By my definition we are back in deflation now. “Deflation is a net contraction of money supply and credit, with credit marked-to-market”. Then you are simply wrong. Government, as Leviathan, simply plays by different rules. They simply don’t do mark-to-market. Price watchers are not only missing the boat, they also fail to take housing prices in their calculations. to do with government fi nances. Really. How does Mosler decide on the right amount of government spending exactly, if not based on a price, viz. government finances? Who benefits from taxation? It is clear that the primary beneficiaries are those who live off of the proceeds of taxation, viz. politicians and the bureaucrats. They pay no taxes, they simply consume taxes. The next class of beneficiaries are of course those that are directly subsidised by society and their taxes. True, which is why when government grows ever larger, the misallocations grow ever larger, which impoverishes the rest of us to ever greater levels. Therefore, the way I see it, we fi rst set the size of government at the “right” level of public infrastructure, based on real benefi ts and real costs, and not the “fi nancial” considerations. And how exactly is all this calculated or ascertained? And how does the monetary system actually divulge anything in this regard? Is Mosler referring to free market interest rates? What exactly? “store” after the government is done with its shopping. Again, how does Mosler decide what the right size is? is about $750 billion annually. Where the f**k did he pluck this number from? higher or a lot lower, depending on the circumstances. Really. 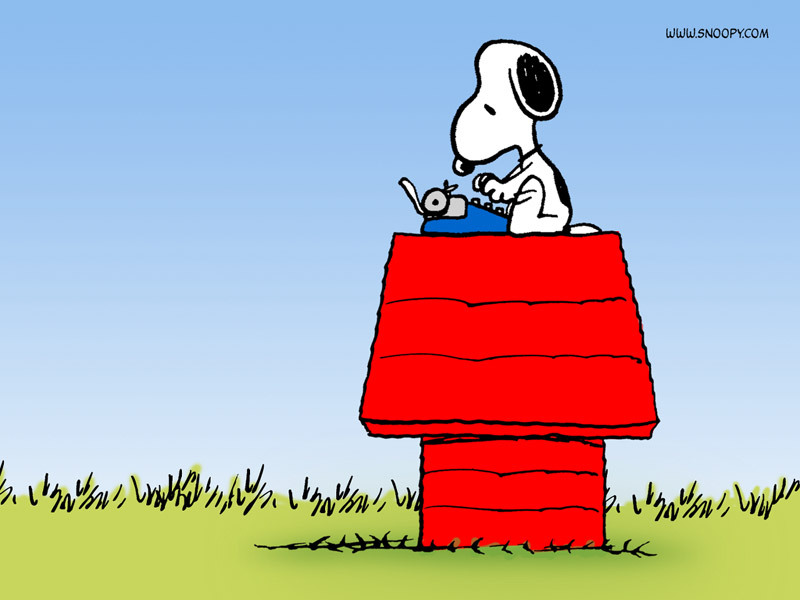 Circumstances change with alarming regularity. So what methodology does Mosler envision for keeping track of circumstances? and scope of government we want. Which is done how again? Money supply, inflation, or deflation? So essentially we are in agreement [the data] with both measures indicating approximately $9 trillion. Of course, the graphs, if viewed independently, might colour your conclusions quite significantly. If you viewed MZM independently, you might conclude that money supply was contracting, and quite the opposite if M1 was viewed independently. 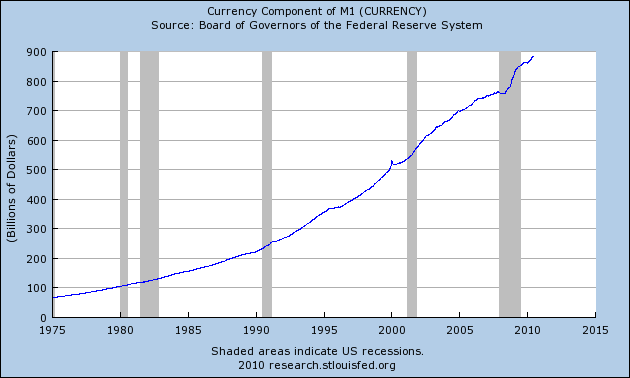 The truth of the matter is that money supply is increasing. Both measures exclude time deposit accounts, which are less liquid and are therefore less available for PV transactions. Inflation of the money supply continues unabated, for the time being. 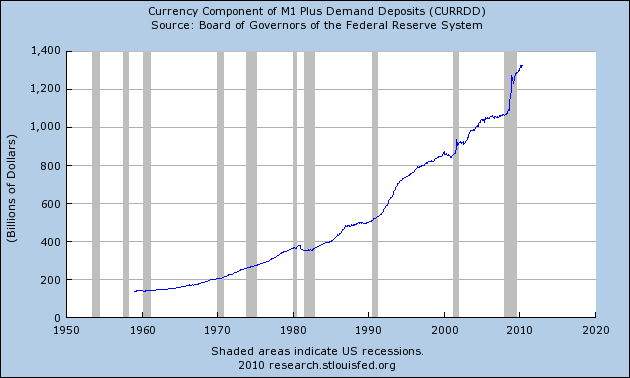 Here is M1 + Demand Deposits, which, counts as liquid money and simply underlines the inflation.